Julien Bayle is an independent artist based in France. 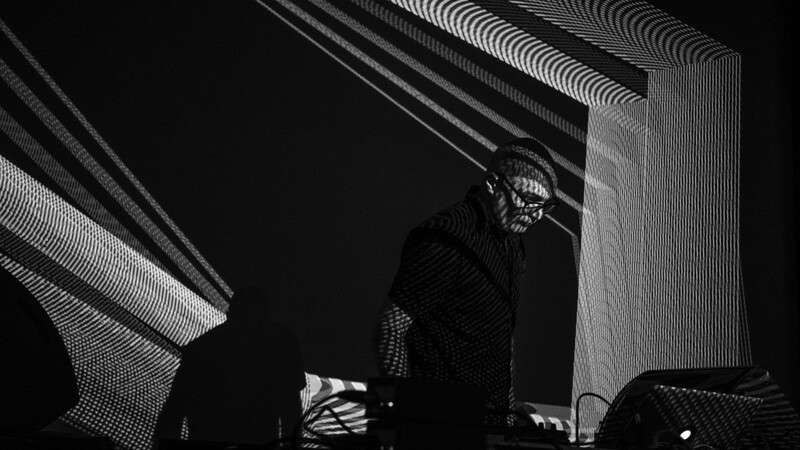 He merges visual art, music composition and a physical approach to sound art and data visualisation by creating advanced programmed installations and audiovisual live performances. He tries to address the question of disrupted continuum, interference and representation of concepts by using the physics of sound. Based on both experimentation and programming his work employs concepts of complexity and chaos as guidelines. Bayle has been invited as a guest art teacher by diverse European art schools, where he provides very advanced technical courses about technology’s place in new media creation. He was nominated for SHAPE by Arcadi Némo. You’ve had an interesting career path – from working in the IT sector, to being an artist and teaching as well, which probably gave you a very diverse perspective on technology and art. My approach is related to technology because technology informs my art. I’m both inspired by technology and also I’m using it to create. I think it is like a dialogue between myself and my tools. I’m interested in designing my own tools in order to go further. It’s not only about the usefulness of a certain tool, rather I consider technology as a partner. I guess this also gives you an advantage over those artists who cannot create their own tools and have to use proprietary/ready-made ones. I think by designing our own tools we can go further. Maybe we can try to create a new tool inspired by an already existing one. We can try to explore things more deeply. For instance, I’m frequently using my modular system, which is like a big framework. I used to do the same with my computer. I take a blank page and try to build networks of signals and networks of networks. I’m trying to connect each part of these routes together to see what could emerge. When we know how to programme or patch, it’s an asset. We can work autonomously and faster. You used to be an IT security architect. When was that? I was working in telecommunications during my university studies here in Marseille. I was interested in the communication of various entities like emitters and receivers, and this still inspires me today when I work with my modular synthesizer. It’s all about signals and their interferences. The disruptions between these various signals and the chaos that ensues are also of interest to you. I’m really interested in the interference between signals but also between people. This is a way with which to represent some part of the world and society, with all the interactions and a lot of saturation on each communication channel. It is quite interesting to build a small patch with my modular synth which can behave in a linear way and at some point when you change just a single value, everything turns into chaos. It is easy to get lost in this kind of structure. And maybe I like being at this threshold, just before getting lost. So it is controlled chaos. I used to want to control everything on my computer or machines. But we cannot control everything. I’m trying to have a stable patch with a high level of stability and then I try to disrupt it and change it progressively to reach the limit just before chaos. Do you think we are still in control of technology, or have we reached the point when technology controls us? I think we are already controlled by technology. I see a lot of people controlled by their notifications. This is the obvious paradox of being connected all the time but the real connections between humans are missing. Maybe we have to become a bit less connected. The whole security issue became a big topic. As a former IT security expert, you probably know it better anyway. I like to work in a less connected manner. This might be the reason why I like to work with my hardware. Is this a natural step away from computers and software? I’m not sure about that, but maybe I feel freer away from my computer. I feel very comfortable working with my modular system. I have a lot of freedom to create with it. What was the main motivation behind switching to the physical, the modular. On my computer processes intrigued me, and because I was able to save and record all of my patches and steps, I got too far from the sound itself. I was more interested in recording parameters than sounds. With the modular synth, the process is not digital and not something that we can save. If I want to keep a trace of a moment or behaviour of the machines I have to record the sounds, which is very basic. Since I started working with machines again I have been more focused on the sound itself, which was my original motivation. It comes from my approach of trying to understand each element of each process. I’m obsessed with details. Maybe this is not only about understanding things but also inverting some parts and changing them from the inside. This is another way to understand the world. We can work globally but we can also work by zooming and seeing a lot of details. When I work on a track, I like to see how each detail interferes with other details. I consider all of these patches and resulting sounds as a building, a construction. This is maybe an approach of exploring everything, seeing how things can interfere with each other, and maybe trying to rebuild things. I like to make sounds even more tangible. I’m working on visualisation systems. I’m trying to extract certain sound descriptors and with all these parameters – like volume, frequency, noisiness, other less usual parameters, etc – I can create various visuals – shapes. I’m using a lot of sound parameters and descriptors as the input of my visualisation systems. Do you also work in the other way – sonifying visuals? I’ve already tried to do that but this is another “science”, I would say. I’m more interested in sound as an input. I’m working on a large project with my modular synthesizer – I’d like to make a taxonomy of each module and maybe try to find a way to write processes inside modular synthesizers. It could be a nice way to further explore all these possibilities in a more scientific way. I like experimenting without a plan, but at this moment I need a specific method, which I’m currently trying to design. Each of my future releases will be related to this bigger, core project. The idea is to be exhaustive and to try to test each possibility, which of course is absolutely impossible.